One of the critical tasks of energy security, which is now being solved by the EU, is the creation of a common gas network, which would include construction of interconnectors, reverse pipelines engineering etc. But Europe, in addition to a pipeline gas, needs a flexible system of supply to any point, when and where necessary. Despite its capital intensity, LNG supplies provide such efficiency. With European imports expected to double by 2025, Europe will become a major importer [of LNG], Massimo Di-Odoardo, Vice President, Global Gas and LNG Research, told Trend news agency. 'There is now enough market space in Europe to absorb this. The market will require new LNG supply as soon as in 2022. By 2025 we expect that 65 billion cubic meters of LNG will be required,' he said. 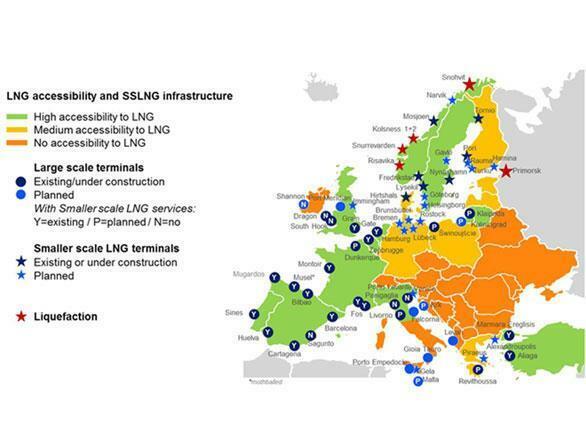 There are enough LNG terminals in Europe today, but if we look at their geographical location, we will notice an imbalance. All receiving terminals are located mainly in Western (France, Spain, the UK, the Netherlands) and Southern (Italy, Greece) Europe. We can't find any on the Black Sea coast. At the same time, past experience suggests that the most vulnerable region in terms of gas supplies is South-Eastern Europe – the Black Sea basin countries, Hungary, Balkan countries. So far, the Black Sea remains an untapped territory for LNG supplies. None of the Black Sea littoral states has an infrastructure that would provide the entire supply chain. The EU may think over ensuring the flexibility of gas supplies at its South-Eastern flank, especially since such a project already exists. I am talking about the AGRI (Azerbaijan-Georgia-Romania Interconnector) project, which could be a pioneer in the region's LNG trade. The project involves transportation of Azerbaijani natural gas (in future it may be Turkmen gas as well) to the Black Sea coast of Georgia (presumably the port of Kulevi), where a liquefaction plant will be built. Further, the LNG will be transported by carriers to the Romanian port of Constanta for re-gasification and then delivered to consumers in Romania, Hungary (Interconnector Arad-Szeged), and probably further to a number of Balkan countries. AGRI is still the first LNG project with tangible shape, proposed in the Black Sea region. At the World Forum of global infrastructure leaders, held in New York in January 2011, it was included in the list of top 100 best infrastructure projects in the world. The AGRI Feasibility Study has already been finalized, with positive conclusions in both scenarios considered (in terms of projected delivery capacity). A source in Romanian Government told Trend in August that financing options might include special EU financing programs for energy - such as Common Interest Projects (CIP), Energy Community Common Interests Projects (ECCIP) and Mutual Interest Projects (MIP) – and/or the banks specialized in financing energy/infrastructure projects. The EU could support Romania and Hungary at the political level and push the project forward, as it meets the fundamental concerns of the entire Union. As the Turkish Straits, linking the Black Sea with the Mediterranean, are already well congested and because of the gradual shallowing of the Bosphorus, Turkey intends to start the construction of a new shipping channel "Istanbul" in the near future in order to increase traffic flow, ease the load on the Bosphorus Strait, as well as to prevent the threat of environmental and man-made disasters. The width of the channel is planned to be 400 meters, the depth - 25 meters. The vessels with a length exceeding 275 meters and a width above 48 meters and with dwt of more than 14,500 cannot pass through the channel. Because of their dimensions, LNG vessels of Q-Flex and Q-Max type cannot enter the channel. Nevertheless, its opening will make LNG supplies from the Mediterranean (and possibly even the Persian Gulf) to the Black Sea possible with potential exporters using conventional gas carriers. Based on data received from Kpler, a data intelligence firm providing transparency on global commodity flows, there are currently only 3 active plants in the Mediterranean: two in Algeria (Skikda, Bethioua) and one in Egypt - Idku. These plants have a total nameplate capacity of 35.6 mtpa (however, the region only exported 13.5 mtpa in 2017). Marsa El Brega terminal in Libya is suspended. Destination countries in the Mediterranean - Spain, Italy, France, Turkey, Greece, Israel and Malta - totally have 14 acting re-gasification terminals with a total capacity of 66.7 Mt. Algerian terminals Bethioua and Skikda have a total capacity of 28.5 Mt. In 2017, the nearly entire inter-Mediterranean LNG flows originated from this country (10.12 Mt vs. 0.22 Mt from Egypt), and this figure remains almost unchanged from 2012. So, as it is seen from the figures, Algerian terminals operate at about a third of their capacity. Hypothetically, Algeria would be able to supply LNG to the Black Sea countries, but it would most likely be very small volumes, given the steadily growing domestic gas consumption, obligations to fill existing and under-construction gas pipelines to Europe, large-scale investments to increase production and some other issues. As for Egypt, its exports are expected to increase in 2019 with Idku liquefaction terminal increasing production and also Damietta being recommissioned. The plant exported its last cargo in November 2012 and has been shut down ever since. The plant has an original nameplate capacity of around 5.05 mtpa. Once fully active, the plant could increase the overall capacity of the region to 40.65 mtpa. However, Egypt is now in the center of a contest for sea shelf of the Levantine basin, where interests of several countries got mixed up. A year ago, the project of delivery of Israeli, Egyptian and Cypriot gas via the EastMed underwater pipeline to Europe was under discussion. Now, Egypt and Cyprus have agreed to lay an underwater pipeline to re-export LNG, primarily to European countries, the Egyptian ministry of oil and mineral resources has recently reported. The situation with the Eastern Mediterranean gas is changing rapidly, and there is no certainty as to how Egypt is going to use its gas reserves. However, Egypt, like Algeria, can be considered a potential exporter of LNG to the Black Sea region.